Create these darling Beach Cupcakes in minutes with a couple simple tips! 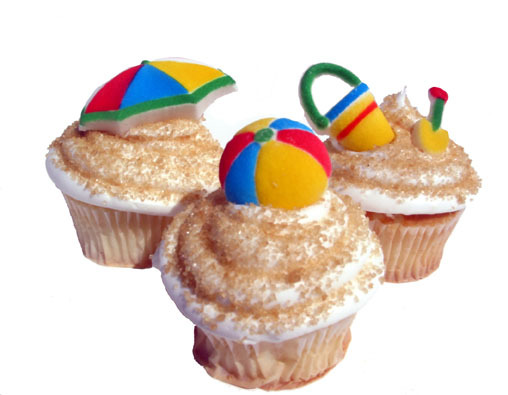 Using brown sugar, create a beach sand scene atop each cupcake. Just sprinkle and pat in brown sugar to ensure it sticks into frosting. Use Sugar Fun in the Sun Assortment (http://www.fancyflours.com/sugar-fun-in-the-sun.html) to top each cupcake with a fun sugar decoration that is sure to please! This entry was posted in Baking Inspiration, Summer Fun Baking and tagged beach, summer cupcakes by Fancy Flours. Bookmark the permalink. I’m anxious to try sugar cookie receipe. these are great for an end of the summer party I’m having but where do I get the cute umbrella,bucket and beach ball toppings?